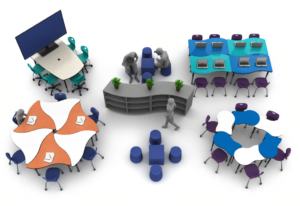 Artcobell helps schools and teachers by offering student furniture for all learning strategies. By working closely with teachers, they are able to better understand and create for 21st Century Classrooms. Through a study conducted in tandem with the Houston School District, they identified the six zones necessary for every 21st Century Classroom. The learning zone houses the worksheets, resources, games, and tech tools for the subjects you teach. It’s crucial to display how subjects interconnect because too many students have a difficult time relating subject matter to other disciplines. Tools and resources should be moved from closets, storage bins, or cabinets and placed in this zone. Provide anchor charts with key ideas and strategies, flashcards, study notes, key people in the field, timelines, and a variety of print materials. Upgrade your word wall by adding visuals and real objects. Organize vocabulary alphabetically or by concept or story — the key is to provide context for each term. Define the zone with a header and comfortable seating. Sharing the classroom space with 20 or more kids isn’t always easy. Some students naturally prefer to work alone, while others only need a quiet zone to catch up on work, study, read, write, take a test, or reflect. Some lounge seating or a spare table and chairs in the corner of your room can be used to define the zone. If possible, provide some earphones to help filter out classroom noise. If needed, use study carrels to block visual distractions. Every classroom needs a sharing zone and, like the collaborative zone, it serves multiple purposes. It helps students connect the dots from one lesson to the next and gives them a space to share what they heard, experienced, or learned that might differ from one student to the next. These discussions are an opportunity for you to evaluate progress, clarify information, address misconceptions, and plan ahead. In the same fashion as the collaborative zone, the idea is to start out leading students in their discussions before letting them facilitate and share on their own. That’s why it’s helpful to define the zone and include the meeting time in your schedule. To learn more about classroom design for your school, contact us and browse the Artcobell Catalog for more inspiration.